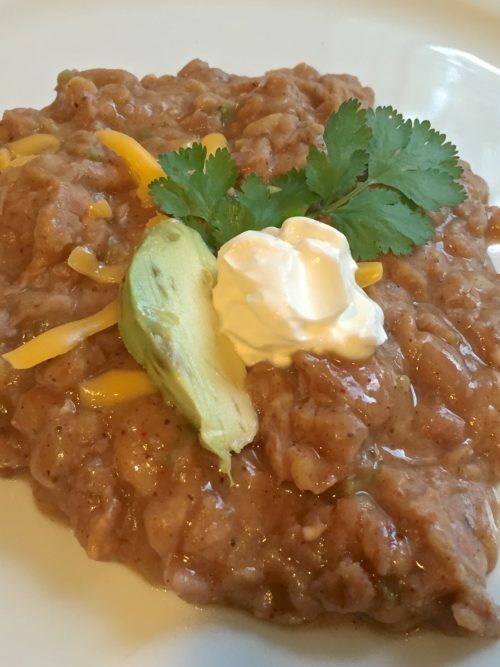 So, what’s so good about these refried beans? 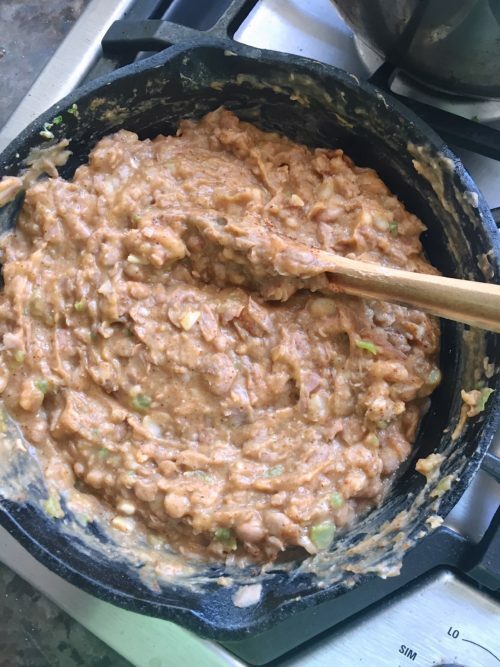 What’s so good about these refried beans? Well, they are homemade. When I was on a girl’s trip last September we had lunch one day at Rancho De Chimayo in Chimayo, NM. This restaurant won a James Beard award in 2016 so I knew when I read that and we were going to Chimayo we had to eat there. We had lunch before visiting the historic village of chimayo which dates back to 17th century and that’s where I first bought blue corn cornmeal that I made these Blue Corn Muffins. I also picked up some freshly ground Hatch green chili powder and green chili flakes which I had never seen in our stores. Rancho De Chimayo, pueblo-style, restaurant has dining rooms throughout the house. Some of the rooms have exposed adobe walls and since 1965 they have been serving delicious authentic Mexican food. They also have outside dinging in courtyard like setting with flowers around. It was beautiful when we were there. We sat on the glassed in porch and it was a very nice lunch to enjoy with forever friends. 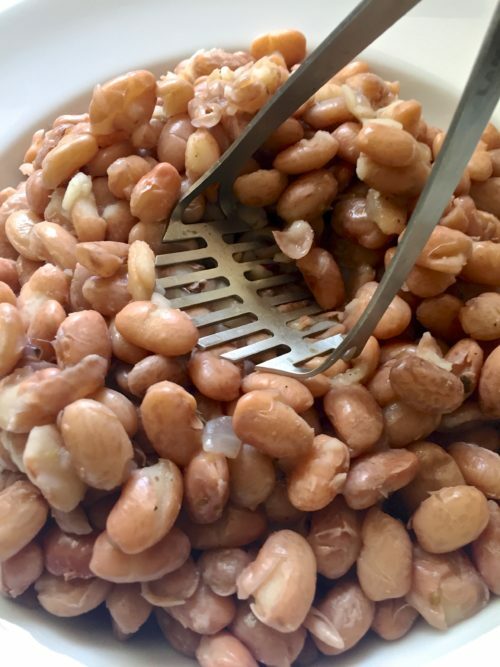 Don’t ask me why I was so impressed with this plate of beans (see picture below). But, even here in Texas, when you are served refried beans they are a blob of pureed mush that doesn’t resemble a bean at all and don’t even get me started about the stuff you scrape out of a can. Going into the restaurant I knew that they had won a James Beard award so I guess from the beginning I was expecting beautiful food. No chips on the table to fill you up before your meal arrived, I liked that. 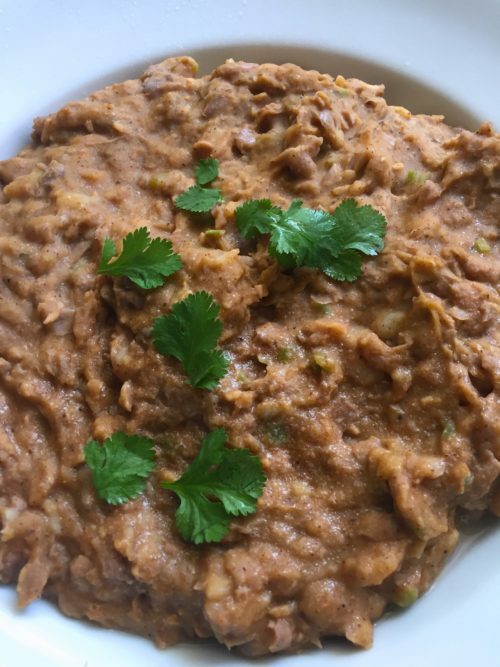 Refried beans is a perfect side dish for any Mexican meal. They are healthy and full of fiber. I did them my second time to go with my Peruvian Grilled Chicken, some Elote (Mexican street corn), rainbow slaw and my Jalapeño Popcorn Muffins. And, for dessert I made Ina Garten’s Rum Panna Cotta with caramel sauce. BLAST FROM THE PAST: My Sloppy Joe recipe is easy to throw together for any quick dinner and the Chicken Gumbo Soup is the secret ingredient. 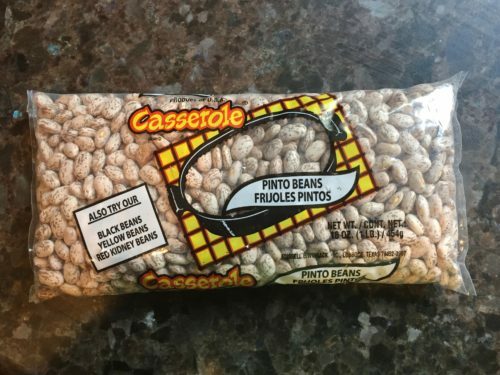 It all starts with this little inexpensive bag of beans. 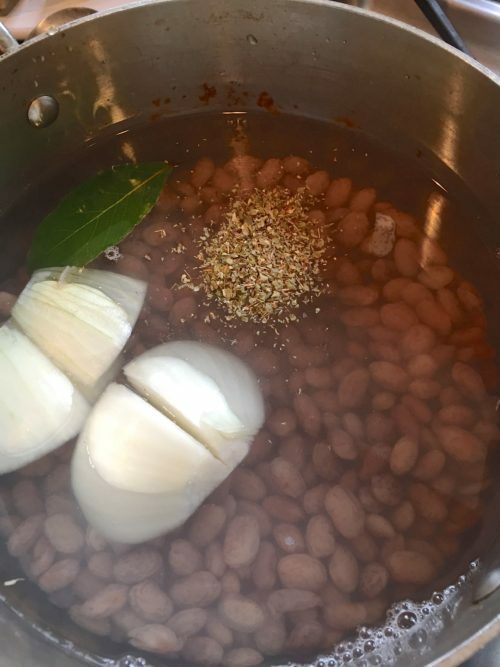 Put the beans, 1/2 an onion and bay leaf in a pot of water along with the oregano and bring to a boil and then simmer until tender. 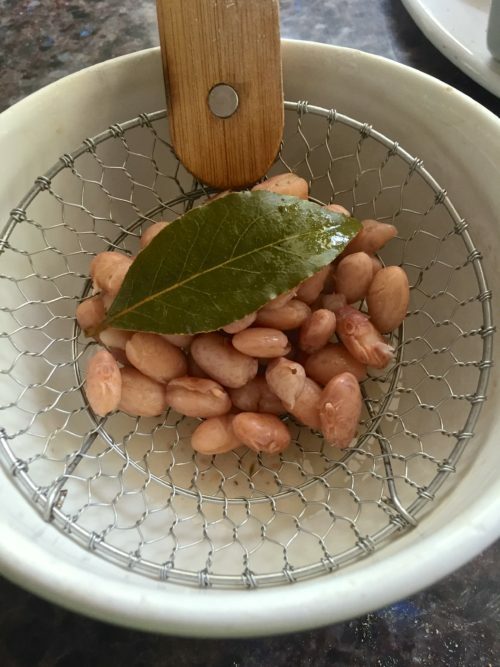 Train the beans and discard the bay leaf. Reserve some of the cooking liquid (about 1-2 cups). 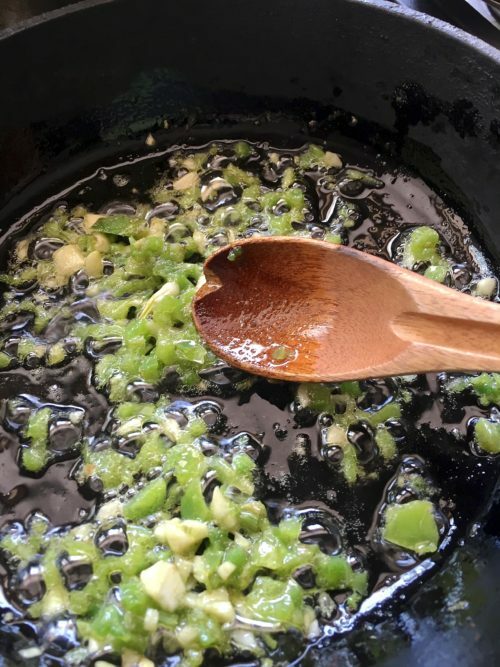 Saute the garlic, onion and jalapeño in a little oil, bacon fat, or lard. Mash the beans using a potato masher, leaving coarse and chunky. Add the mashed beans to the skillet with the cooked onion and jalapeño. Season with the chili powder, salt and pepper to taste and the cumin. Top with some chopped cilantro. 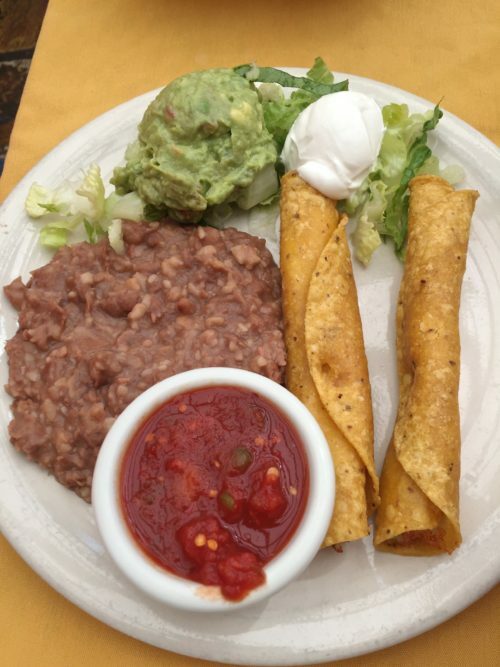 This beautiful plate is from Rancho Chimayo. My beans don’t look as red as hers but mine were delicious. No chips and salsa on the table to ruin my meal so I enjoyed every bite of this lunch. Their beans seem a little more chopped than mine. I did grab my avocado masher instead of the potato masher which has smaller holes (I’ll use that the next time I make these.). 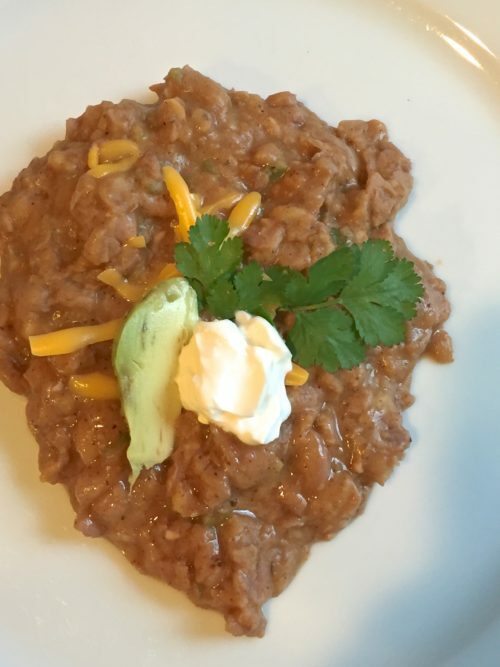 After having delicious refried beans at an award winning Rancho Chimayo I had to try to recreate this simple side dish. Put beans in pot with water, bring to boil, turn off heat and let set an hour. Drain off water (reserve about 1-2 cups), add fresh water, onion, and oregano and bring to a boil. Once it is boiling reduce to simmer and cook 1 1/2 - 2 hours or until the beans are tender when pierced with a fork. Put the olive oil in skillet and add the garlic and jalapeño and cook until the jalapenos start to soften. Add in the drained beans and cook for about 5 minutes. Add in about 1/2 cup of the bean broth and using a potato mash, mash leaving a coarse mixture. Some people put in blender or use a stick blender but I don't like soupy beans.